Does anyone remember what one bitcoin was worth 5 years ago? It was about $13 and from that the prices rocketed especially for Bitcoin where it reached a record high of almost $20,000 (£15,500) shortly before Christmas last year, leading to all initial investors getting “insanely rich” as stated by Arwa Mahdawi in her recent Guardian article. However, now the circumstances have changed as virtual currency seems to have entered a death spiral, with prices plummeting since early November. 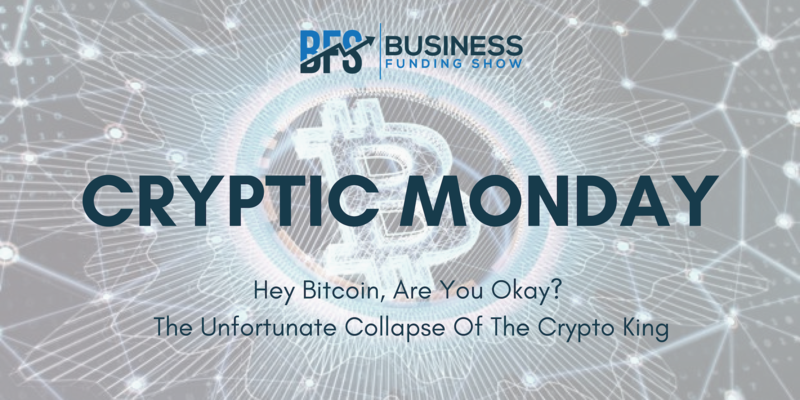 Figures recorded in Jess Clark’s City A.M. article clearly depict the downfall in the value of Bitcoin which has been has been sliding to as low as 7% after hitting a 13 month low. Furthermore, on Monday, 19th Nov we experienced the world's largest cryptocurrency drop below $5000 for the first time in more than a year to its lowest since October 2017. Arwa highlights research done by experts that claim that the crypto boom was never real to begin with and could be a result of manipulation rather than legitimate demand alongside other factors such as hacks and regulatory crackdowns. Almost everyday new cryptocurrencies emerge, old die, early adopters get wealthy and investors lose money. It is part of the process especially for a volatile and unpredictable market like of cryptocurrencies. Curious to learn what the future holds for the crypto world for the year 2019? Join us at EU & UK’s only funding exhibition, The Business Funding Show '19 where there will be an exclusive section dedicated to the blockchain and crypto industry. Check for more info here.